2015 Westover Hills Home Tour is next weekend! Get your tickets now! 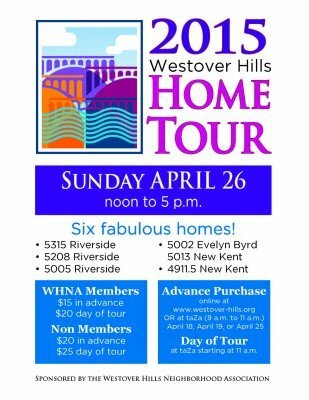 The 2015 Westover Hills Home Tour is next weekend, Sunday, April 26, from noon to 5 p.m., and features six fabulous homes. (Click here for descriptions of the homes). Get your advance tickets from 9 to 11 a.m. at taZa on Saturday, April 25. Or you can order advance-sale tickets online by clicking here. Advance tickets are only $15 each for WHNA members (and you can buy as many as you want at that price for friends and family), or $20 each for non-members. Tickets the day of the tour go up to $20 for WHNA members or $25 for non-members. Tickets will be sold the day of the tour at taZa starting at 11:30 a.m.